"Taking someone's life is doing them a favor. A huge favor. Let them live. It's what they deserve." Barbet Schroeder's Our Lady of the Assassins is an unflinching look at how violence plagues modern society. While I feel that Schroeder has taken a few wrong turns in his career, Our Lady of the Assassins marks a return to top form for the prolific director. He has gone to great lengths to ensure that his vision of inherent bloodshed shines with authenticity by filming on location in the hazardous city of Medellin, Columbia. Adding to the grim aesthetic of this dangerous locale, Schroeder shot the entire film using high-definition video cameras. My initial reaction to this unique approach was that the visual appearance is nothing more than that of a bad soap opera. Yet, as the story and characters began to develop, I felt as if I was watching a gripping documentary. This inimitable style combined with the dense and elusive subject matter has resulted in Barbet Schroeder's most honest and triumphant film in 10 years. The story follows openly homosexual author, Fernando (German Jaramillo), who has wearily returned to his hometown of Medellin, as he puts it, "to die." Upon his return, he is instantly taken with 16-year-old Alexis (Anderson Ballesteros), a street tough boy who knows no other life than the violence that surrounds him. The two immediately form an uncommon bond of sexuality and friendship. They spend much of their time wandering the sweaty streets of Medellin, where drug deals and murder are as typical as children playing in the park. As Fernando bears witness to the horrific den of brutality that Medellin has become, he initially exclaims that he is vehemently opposed to all violence. Yet, Alexis embraces it as if it were a virtue, gunning people down for looking at him the wrong way. Fernando educates Alexis on his views towards violence, speaking to him with a writer's literary profundity: "If we killed everyone we kill in our heads, life would be butchery!" Alexis, on the other hand, defends his magnetism towards violence as a necessity. As a result of their time together, the two begin to invoke changes in one another, each of them slowly transmuting to embrace the other's point of view. Everyone who watches Our Lady of the Assassins will more than likely have contrasting opinions towards this introspective film. Part of its beauty is that no answers are given for the many questions that arise; rather, it is a bold statement on how violence has become all too commonplace and has raped the innocence of the human race. Yet, it is also a moral dilemma, questioning the presence of religion and God in a world over-abundant with sin. The characters are all but devoid of morality, yet many of them embrace religion as if it will miraculously wash away all of their sins. Alexis delivers a stunning dialogue of how "blessed" bullets dipped in holy water are guaranteed to connect with their target, a glaring inconsistency that proves he conveniently chooses to ignore God's first commandment, "Thou Shalt Not Kill." Fernando spends much of his time praying in church, although he does not believe in God. He is convinced that all the terror and violence around him could only exist in a godless world. Is the surge of violence and amorality a sign that God has given up on the human race? Or is it God's way of beckoning us back to Him? The filmmakers introduce these fascinating questions, yet it is the job of the audience to discover the answers. Unfortunately, Our Lady of the Assassins is not flawless. Much of it is too meditative and plodding for its own good. Most disappointing is the way in which the third act becomes weighted down with clunky metaphors and overt symbolism. The film triumphs as a character study between Fernando and Alexis. When their fascinating dialogue is replaced by an awkward attempt at visual flair, the film falters. Imperfections aside, Schroeder has created a powerful story that successfully drives its message deep into the heart of the viewer. Its heavy substance is capable of inspiring intense discussions. Image Transfer Review: The image transfer of the original high-definition video elements is striking. With the exception of a few instances of minor video noise, the picture is incredibly smooth and blemish-free. Colors are often bold and lifelike; the warm yellows and aqua blues stand out vividly on top of the deep blacks. On the downside, the image appears slightly soft in several scenes, and hues often appear fuzzy and unbalanced in shadowy interiors. While these deficiencies prove distracting, there are moments where the image exhibits an eye-popping, three-dimensional presence. Audio Transfer Review: The Dolby Digital 5.1 soundtrack is impressively dynamic. Cleanliness and fidelity are remarkable; the soundtrack never appears harsh or strident, even at peak intensity. Surround presence is frequent and pleasing, often filling the soundfield with the gentle sound of rain or street noise. Split surrounds engage aggressively during shootouts, but the whizzing bullets sound more like squeaking mice than realistic gunfire. Qualms with sound effects editing aside, the 5.1 mix effectively blends in with the on-screen visuals and heightens the cinematic experience. Extras Review: This disc is as barebones as they come, with nary a featurette or theatrical trailer in sight. Particularly disturbing is the inability to toggle the English subtitles on and off. This blatant oversight is a slap in the face to Spanish-speaking viewers. This is a compelling and thought-provoking film with terrific audio and video transfers to boot. 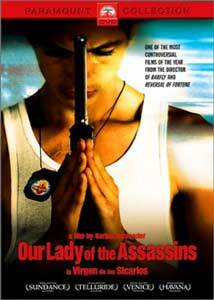 However, with its lack of special features, Our Lady of the Assassins is a disappointment to the DVD format. Highly recommended entertainment for anyone whose interest in movies supercedes their interest in special features.